The Goods and Services Tax (GST) is potentially a game-changing indirect tax reform. Apart from simplifying the current indirect tax structure, GST should help create ‘One’ India by eliminating geographical fragmentation, according to a report by Nomura. 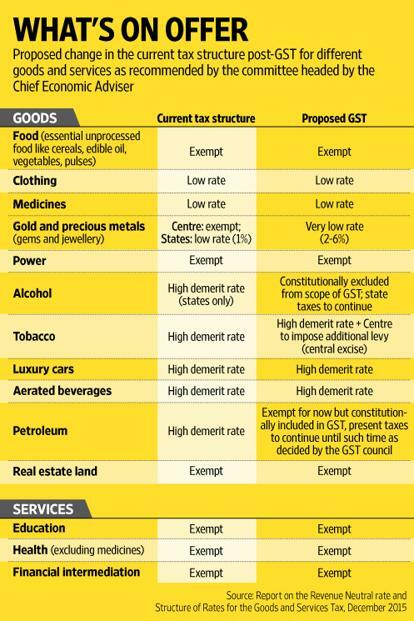 Political consensus now seems to be changing in favour of GST and it is likely to become a reality soon. While short-term macroeconomic implications of GST would be mixed, longer-term implementation should lift the growth and enable greater general government fiscal consolidation, said the report, India Goods and Services Tax: Making “One” India. GST will be generally positive for consumption-related sectors like auto, consumer durables and fast-moving consumer goods (FMCG). Logistics should benefit from the removal of inefficiencies in inter-state taxation and check posts. The services sector, however, would be impacted negatively due to the higher tax burden. The GST is a destination-based indirect tax on goods and services levied on the value added at every stage, from manufacturing to consumption. It involves a continuous chain of input credit set-off benefits starting from the producers, through the service provider and up to the retailer level. From a macroeconomic perspective, the short-term impact of GST could be mixed but the long-term impact will be clearly positive. It may have negative impact on GDP growth in the short term, as higher taxes on services (60% of GDP) would hurt consumption of discretionary services; and firms are unlikely to immediately pass on impact of lower taxes on goods to consumers, thus limiting the boost to consumption of goods. However, productivity gains are expected in the longer term from a simplified, more efficient tax system and the removal of interstate tax barriers. The introduction of the GST should simplify and unify the indirect tax regime in the country, which is currently riddled with complexity owing to multiple state and central taxes, a multitude of exemptions and incomplete input credit across different taxes and between goods and services. Edited excerpts from Nomura report, India Goods and Services Tax: Making “One” India. Previous Previous post: Rahul Gandhi vs RSS: What does it mean for GST Bill?